On 28 January 1915, Giuseppe, Ricciotti and Santo Garibaldi visited the Musée de l’Armée and were received by General Niox, director of the Musée de l’Armée. 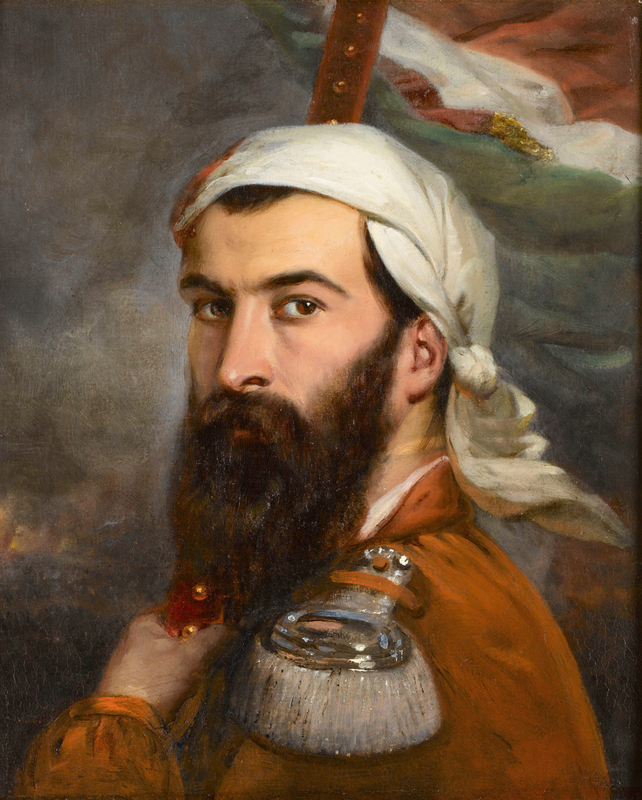 They were three of the many grandsons of the famous Giuseppe Garibaldi (1807-1882), the great architect of Italian unity in the 19th century and who supported France during the war of 1870-1871. Niox showed them the sword worn by Napoleon at Austerlitz, to which the three Italian officers paid homage. 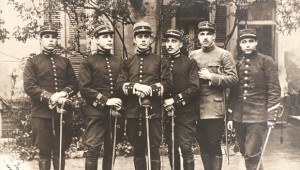 The photograph, taken before this event, on this occasion dedicated to general Niox, brought together the six sons of General Ricciotti Garibaldi, Garibaldi’s fourth son, who enlisted to fight in France at the start of the Great War, even though Italy had not yet joined the allies: from left to right, Bruno, Ricciotti, Giuseppe called Peppino, Sante, Costante and Enzo. Two of them, Bruno and Costante, died during the fighting in Argonne (the first one in December 1914, the second one in January 1915), but the other brothers survived the conflict. The four brothers to the left of the picture are wearing the uniform of the Foreign Legion particularly recognisable by the badge with a number decorating the collar and the kepi. Each one’s rank is also indicated on their sleeves and kepis. On 29 January 1915, on the day after this visit, in the main courtyard of the Invalides, several of their compatriots enlisted to fight on the French front. 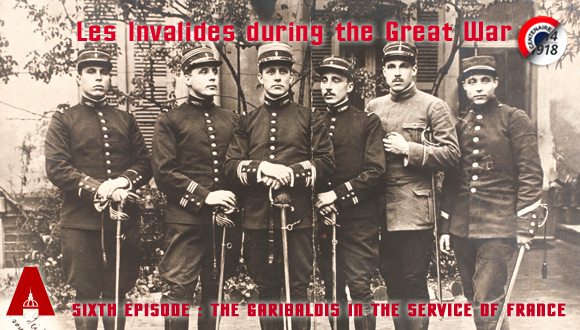 In December 1914, even though Italy was still one of the neutral countries, a unit of Italian volunteers enlisted in the French army: this was the 4th march battalion of the 1st Regiment of the Foreign Legion, generally called the «Garibaldi Legion». It was commanded by Lieutenant-Colonel Giuseppe Garibaldi (1879-1950) who can be seen in the photograph. In its ranks was also Lazzaro (Lazare) Ponticelli (1897-2008), who later on became French. Lazare Ponticelli, the last French survivor of the Great War, was given a state funeral at the Invalides, on 17 March 2008, attended by the President of the Republic. 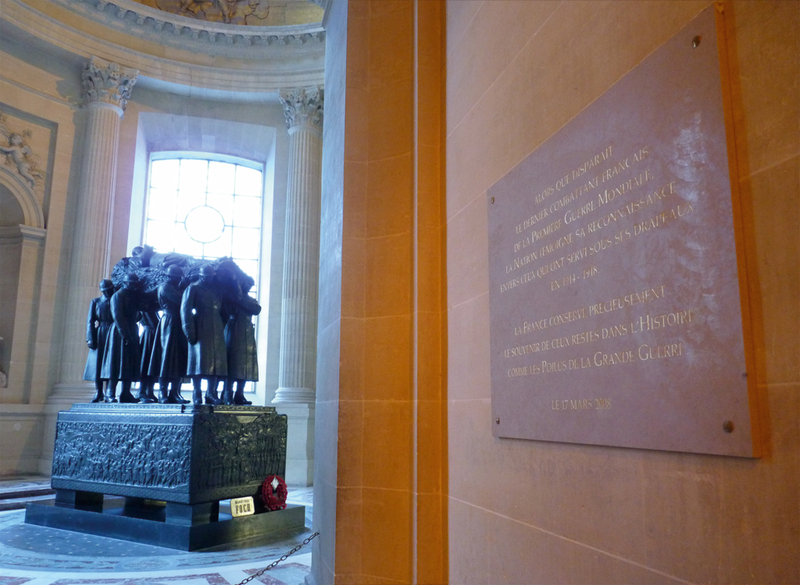 A commemorative plaque in his memory can be seen under the dome of the Invalides, close to the tomb of Marshall Foch.